Civics Education Isn’t About Content or Activism — It’s Both. Today is Constitution Day and Citizenship Day, observed each year to commemorate the signing of the Constitution on September 17, 1787 and “recognize all who, by coming of age or by naturalization, have become citizens,” according to the Library of Congress. It makes for a good occasion to reflect on the state of civics education in America, a topic that has received renewed focus since the 2016 presidential election. One question that is often debated in this conversation is whether civics education should focus on teaching content and critical thinking skills, or encouraging civic engagement and activism. This presents a false choice, as schools should be responsible for ensuring that students are both adequately informed and sufficiently engaged — not one or the other. One side of this debate contends that civics education should first and foremost provide students with a basic understanding of how the American political system works and teach them how to think about political issues. Under this approach, students should develop a well-informed understanding of all sides of an issue, including the underlying facts and proposed solutions, only venturing into political activism once they have mastered the necessary knowledge and skills. This approach is well intended: it is important to cultivate a citizenry capable of robust debate that honestly grapples with the benefits and tradeoffs associated with each issue. 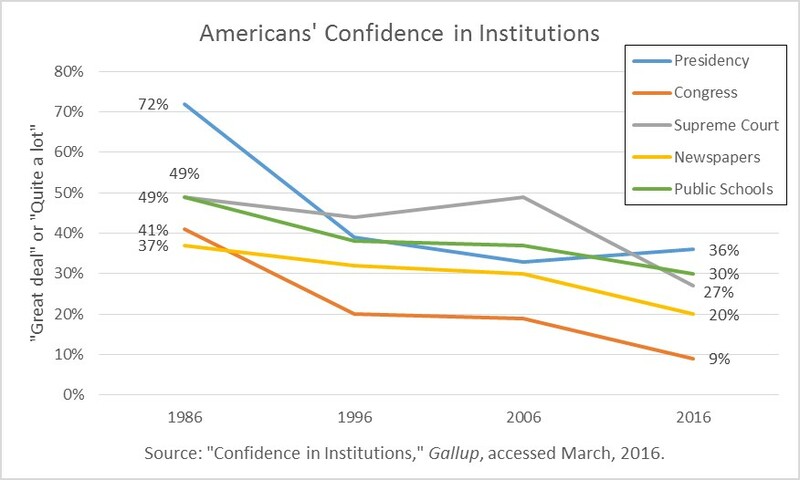 And improvement is certainly needed, based on students’ poor performance on the National Assessment of Educational Progress (NAEP) civics assessment, which measures “the civics knowledge, skills, and dispositions that are critical to the responsibilities of citizenship in America’s constitutional democracy.” According to the most recent civics assessment, last administered in 2014, only 23 percent of eighth grade students scored at or above the proficient level. 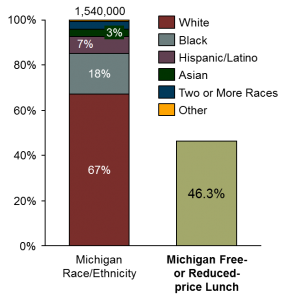 In 2010, when NAEP last tested high school seniors in civics, only 24 percent scored at or above the proficient level. 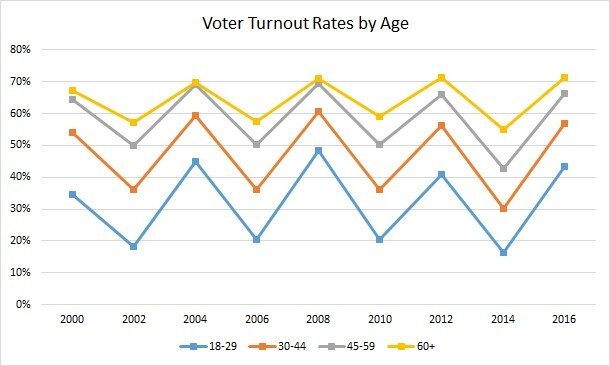 However, neither of these results has changed significantly since 1998, and it’s not as if older voters — who vote at much higher rates than younger voters — are necessarily bastions of civic knowledge. 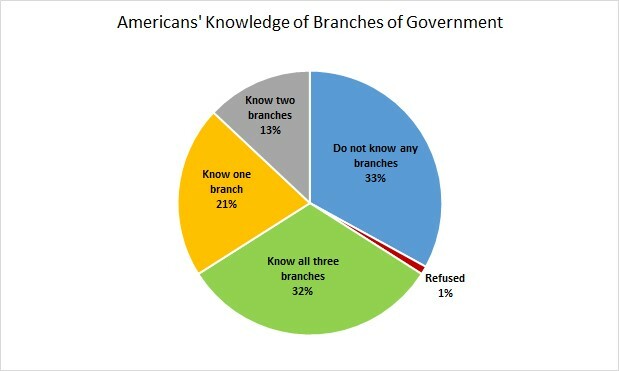 For example, according to the most recent results from the Annenberg Public Policy Center’s annual civics survey, released last week, fewer than one third of Americans can correctly name all three branches of government, and many also lack important knowledge about how each branch functions. Additionally, civic engagement, particularly voting, is not just about making a well-reasoned choice between two or more options. It’s also a way of demonstrating political power. When young people aren’t engaged, they are leaving their figurative voice out of the political conversation, meaning the issues they care about may receive less attention, and policies that affect young people may be enacted without their input. Our education system should have a strong interest in empowering young people and starting them on a path of self-advocacy. While the goal of civics education should be to both adequately inform students and get them engaged in the political process, it’s clear that we aren’t doing a good enough job on either front. This isn’t surprising when you consider how little time is spent on civics education. Based on a recent analysis from the Center for American Progress, 40 states require coursework in U.S. government or civics. While nine states require one year of such coursework, 31 only require a half-year, and 10 states have no requirement at all. If we want to ensure that the next generation of citizens is sufficiently prepared for civic life, we need to commit the necessary time and resources — certainly more than one semester. We should view this Constitution Day and Citizenship Day as an opportunity to rededicate ourselves to the civic mission of schools. This entry was posted in Education Policy, Federal Education Policy, State Education Policy and tagged annenberg public policy center, Center for American Progress, Citizenship Day, Civics, civics education, Constitution, Constitution Day, government, NAEP, politics on September 17, 2018 by Phillip Burgoyne-Allen. In Light of DACA Repeal, What Can Educators Do Now? 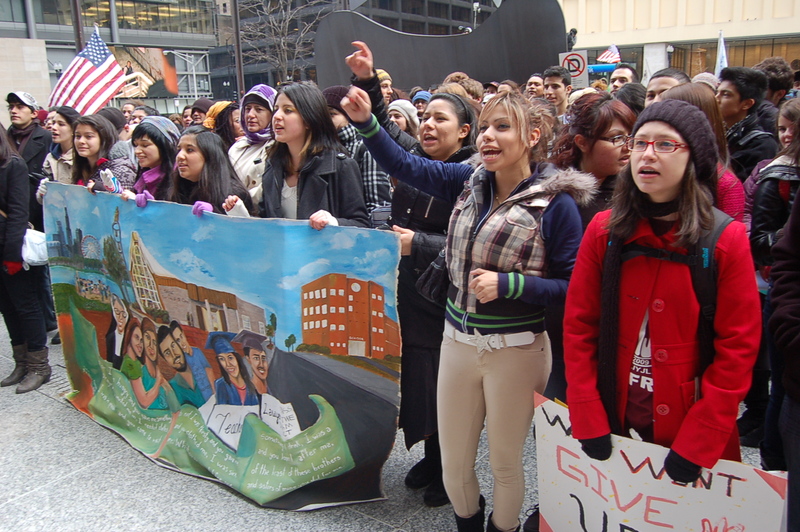 An Immigrant Youth Justice League rally in 2011. Photo via Flickr user peoplesworld. Having immigrated to the U.S. from the Philippines at four years old, I know firsthand the difficult decision my parents made to leave behind the country they called home in search of opportunity for my family. Although I have family abroad, this country is the only place I know as home. Recipients of Deferred Action for Childhood Arrivals (DACA) were brought to the U.S. as young children by parents who made the courageous decision to leave the only home they knew, often due to danger, conflict, poverty, or a lack of opportunity. While my immigration story is different, I can’t help but feel connected to the 800,000 DACA recipients whose only chance of hope and a future in this country was abruptly taken away from them this week. Make sure students and their parents know their rights. Provide students with materials they can share with parents, particularly in-language translated materials, such as those from Remezcla and Here to Stay. Have these materials readily available in the classroom to allow the students to pick up on their own time – if and when they’re ready. In addition, it’s important to clarify any misconceptions and myths that students hear on a daily basis. For instance, many undocumented families may fear that immigration authorities are present in schools and that undocumented students may be vulnerable to deportation at school. Clarify your school or district’s policy to protect immigrant students (see, for example, the National Education Association’s “Safe Zones” resolutions policies or Virginia’s guidance regarding school division responsibilities and actions in reference to students and immigration) and ensure students and parents know that school is a safe environment for them. Uplift and value the experiences of immigrants and students of color. Celeste Hayes’ “How to Decolonize a Classroom” addresses the whitewashing of narratives about people of color in history. Teachers can actively uplift the stories and voices of immigrants and people of color by being intentional about the historical figures they post on their classroom walls or the projects they assign to their students. Incorporate cultural competency in lessons. 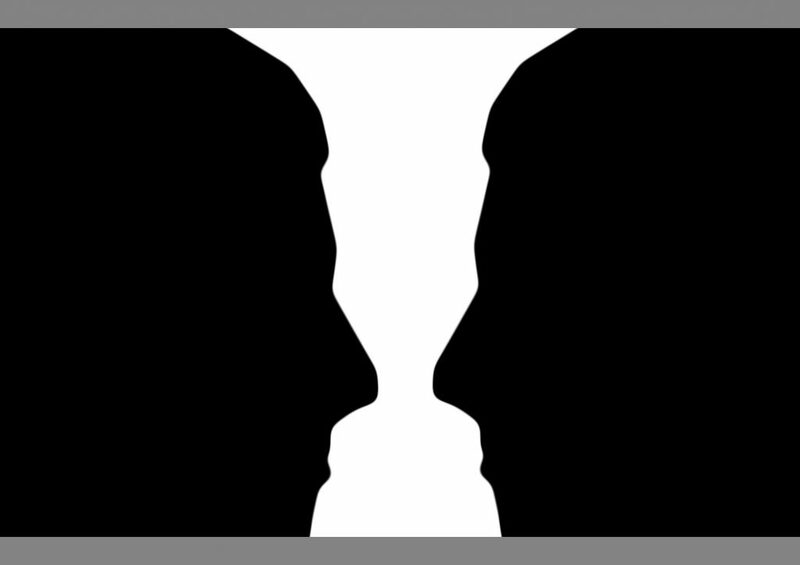 Teach Tolerance offers a number of instructional resources on diversity, identity, and social justice that teachers can use to help facilitate difficult conversations on topics such as race, immigration, and inclusion. No matter how difficult, these discussions are vital to creating a welcoming environment for all students, particularly during these uncertain times. While conversations about immigration and inclusion may seem most relevant to classrooms with large immigrant populations or students of color, it is equally if not more important to make sure these conversations take place in schools with small minority populations. Students take these discussions outside of the classroom and to their homes, and if we’re trying to make our country a more immigrant-friendly place, then teachers must make a conscious effort to create such environments in their classrooms. DACA recipients are among our students, teachers, friends, and neighbors, all of whom are inextricably woven into the fabric of America. Repealing this executive order, with no guarantee from Congress that timely legislation will pass before it expires, is irresponsible and inhumane. In the meantime, educators play an important role in ensuring that immigrant students feel like they belong in the classroom — and in this country. This entry was posted in Equity, Federal Education Policy, Politics of Education and tagged Cultural competency, DACA, deferred action for childhood arrivals, Immigration, politics on September 8, 2017 by Justin Trinidad. Tonight is Betsy DeVos’ confirmation hearing to become the next Secretary of Education. Because DeVos doesn’t have a track record as a government official or leader within the public school or higher education system, as most of her predecessors do, analysts are looking at her role as a funder, GOP donor, and board member of education organizations to understand what she might do as Secretary. This scrutiny has drawn particular attention to DeVos’ engagement in education advocacy and political causes in Michigan, where her donations and advocacy have touched many major education policy decisions over the past 20 years. In many ways, the education system in Michigan is a microcosm of the challenges and opportunities facing the broader U.S. education system — and the next Secretary of Education. In both Michigan and the U.S. as a whole, there are large, persistent achievement gaps for disadvantaged student groups; rural, suburban, and urban schools with unique (sometimes competing) needs; and a long history of hotly debated education reforms that have had mixed success. To help analysts, journalists, policymakers, and practitioners make sense of the education landscape in the Wolverine State — and what it suggests about the perspective and positions DeVos would bring to the role of Secretary — Bellwether has compiled a comprehensive fact base about the education policy landscape in Michigan that we will release next week after the Inauguration. There are over 1.5 million students in Michigan and nearly half of them qualify for free and reduced-price lunch; more than 33 percent are students of color. Michigan ranks 41st in 4th grade reading performance in the U.S. and 42nd in 4th grade math. 35 percent of Michigan 11th grade students are college-ready according to the SAT; there are substantial gaps in college-readiness rates among black, Hispanic, English language learner, and low-income students. Michigan has one of the nation’s largest charter sectors, with 10 percent of students enrolled in charter schools, about 300 charter schools, and over 40 charter authorizers. Over 70 percent of Michigan charter schools are operated by for-profit education service providers. Detroit is the lowest performing urban school district in the country. Detroit charter schools generally outperform Detroit Public Schools, but there are still concerns about the overall quality of the sector. What should be the role of the federal government in addressing longstanding achievement gaps for low-income students and students of color, like those that exist in Michigan? As you know, Detroit students have struggled academically and gone through numerous failed reform efforts over several decades. Given your work in Detroit, what turnaround strategies would the Department of Education encourage for chronically low-performing school districts? What did you learn from advocating for expanded school choice measures in Michigan and how might you enact those measures at the federal level as Secretary of Education? The presence of multiple charter school authorizers in Michigan has decentralized charter responsibility in the state. What quality-control and accountability measures are necessary for charter school authorizers? What should be the federal role in setting that bar? What has your experience and observation of school choice and school turnaround efforts in Michigan taught you about potential strategies for improving low-performing schools? How would those lessons be applied to this spring’s review of states’ Every Student Succeeds Act plans? Betsy DeVos’ hearing begins at 5pm and can be watched here. Check back here tomorrow for a recap of major events (and anything about Michigan education that needs a fact check). To read our other coverage of Betsy DeVos, click here. This entry was posted in Charter Schools, Education Governance, Education Policy, Federal Education Policy, Politics of Education, School Choice, Student Data and tagged Accountability, Betsy DeVos, charter schools, data, DeVosDebate, Donald Trump, education data, ESSA, michigan, politics, School Choice, School Improvement, Senate HELP Committee, vouchers on January 17, 2017 by Kaitlin Pennington and Bonnie O'Keefe.